In the late 1800s, men like Jacob Brock and Henry Addison DeLand introduced civilized comforts to the wild interior of West Volusia, which resulted in a tourism boom that is still ongoing. Brock built the Brock House hotel and used his steamboats to bring such notables as DeLand and American presidents Ulysses S. Grant and Rutherford B. Hayes there to vacation. Continued tourism growth brought about the need for more hotels. The Ponce de Leon Hotel was built around the fabled Fountain of Youth, while the bustling town of DeLand offered several more hotels, like the Putnam, Carrollton, College Arms, and DeLand. John Batterson Stetson vacationed in DeLand and then built a home, bought a hotel he renamed College Arms, and extended the railroad to his hotel's doorstep for the convenience of his guests. These and other hotels helped shape the growth and history of West Volusia County. Author Larry French is a Floridian, living history reenactor, and member of the Florida Historical Society. He served as executive director of the West Volusia Historical Society and provides historical narration for Great Tasting Tours. French was also an educator and feature writer for publisher Houghton Mifflin Harcourt. He has written the history-based fiction adventure novel series Time Will Tell. 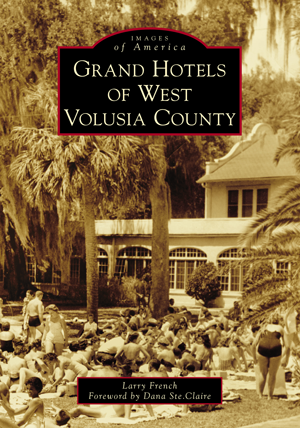 Grand Hotels of West Volusia County utilizes vintage images from a variety of sources, including the Bill Dreggors family, City of Lake Helen, Enterprise Heritage Center and Museum, Florida State Archives, Lake Helen Historical Museum, and Stetson University duPont-Ball Library.